Happy Monday! Today I have a finished garment to share. I still have quite a backlog of garments that I've made this year that need to be photographed. Here is one! 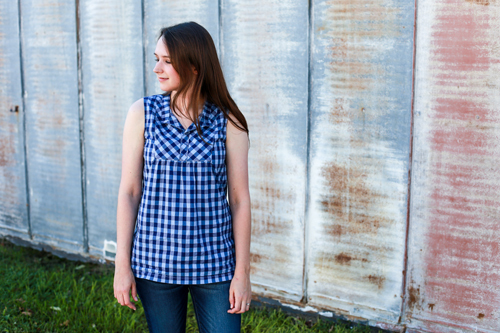 I've made a number of Tova tops over the year (here, here, and here are a few), but I've never made a sleeveless one. 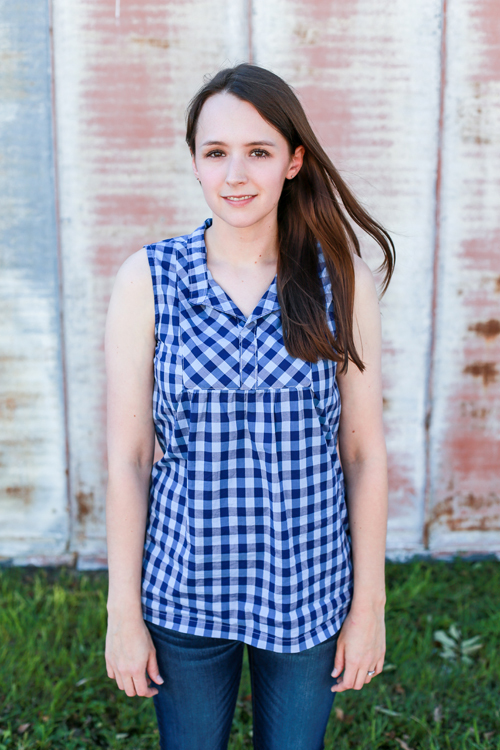 This Summer I decided to make both a long sleeved version and a sleeveless version. The pattern as written has 3/4 length sleeves, which make it difficult to wear with a cardigan. Since I'm always cold, this makes the window to wear them slim. Wiksten Tova Pattern by Jenny Gordy. 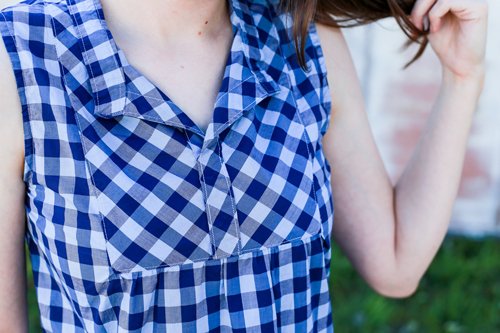 This sleeveless version was super comfy to wear this Summer, it's a very light and breezy top. I used some beautiful woven Liberty gingham that I picked up at SR Harris in March. It was a little over a yard, so I wouldn't have been able to make a Tova with sleeves from it. I cut the inset pieces and the plackets on the bias for a bit of added interest. I also sew my placket together, about three inches up so that it's a bit more modest. This way I don't need a tank under it, it's perfect all on it's own. I definitely see more sleeveless Tovas in my future. Next time I think I will shorten it by about an inch. With jeans it's fine, but with shorts it looks a little long. Thankfully, that's an easy fix! Love this! Very much like the bias detail. 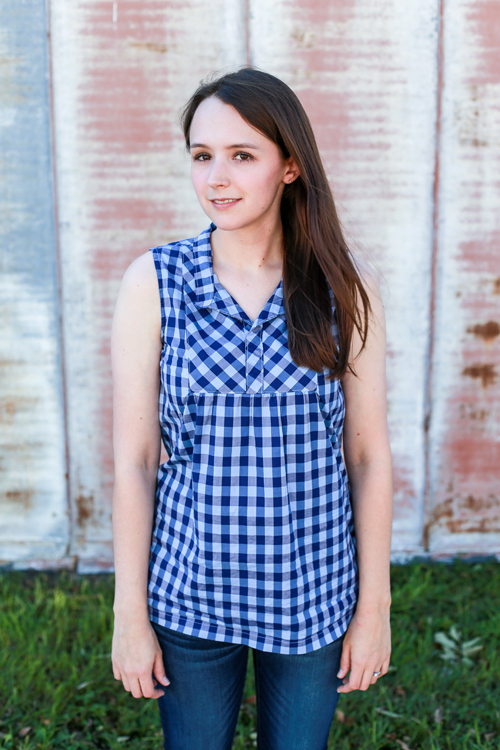 I'm such a sucker for a bias cut placket! 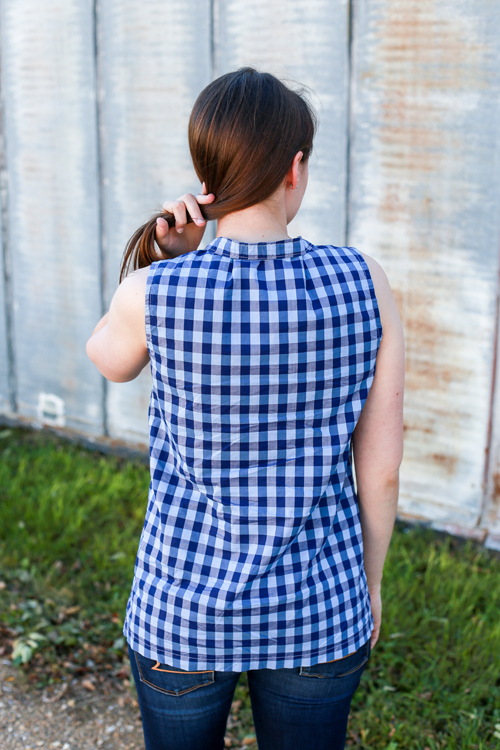 I'm just dipping my toe into the sewn garment world and am excited to tackle this pattern when I feel up to it. So cute on you, Jeni! And kudos on the great work you did laying out the fabric. I'm going to have to make one for myself after seeing all of yours. Jeni, you are so pretty I like this blouse. I need the pattern. You did a lovely job putting yours so meticulously together. Did you put tucks into the back neck of yours? My collar comes out too short - once I just chucked it and bound the neck with bias tape and the second one is sitting around waiting for me to figure out what to do. I didn't, I've never had that issue before in all the ones I've made! how did you sew the placket together 3 inches up? I agree, I wish it weren't so low cut. I pinned the two sides of the placket together and stitched along the top-stitching lines to secure them together.